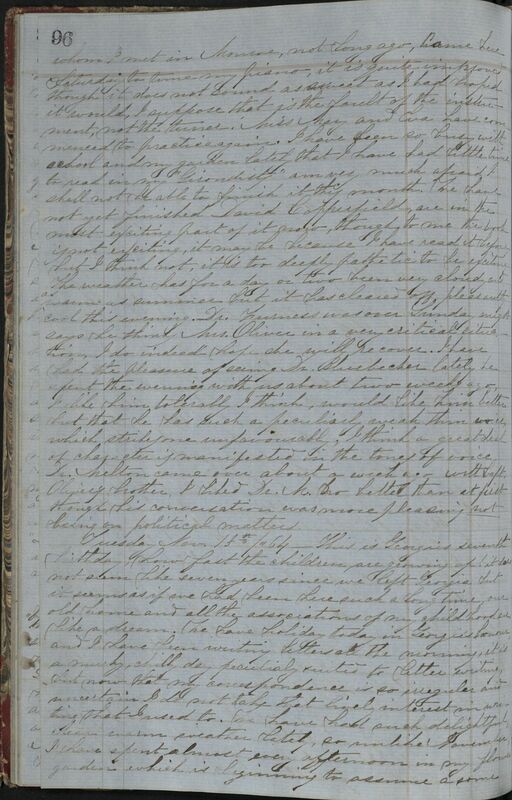 Item Description: Diary entry dated 9 November 1864, written by Sarah Lois Wadley. Item Citation: Folder 5, Sarah Lois Wadley Papers, #1258, Southern Historical Collection, Wilson Library, University of North Carolina at Chapel Hill. Yesterday was a day which will be ever memorable on this continent, the election day in the United States, what a struggle it must have been! We cannot hear the result for some time, we shall wait with great anxiety, there is probably more solicitude about this election in the South, and more excitement in the North than in the one of four years ago. I have been very busy in my little garden, planting some violets and hyacinths, we have laid out half of it in beds and I think it will look quite pretty, it is a great pleasure to work in it, rests my mind a great deal but is very tiresome to the body, my shoulders ache me badly, but this is nothing, nothing to the trouble and anxiety and weariness of my mind this morning, sometimes I feel as if I am doing no good to the children. Oh! if I could only be more patient, if I could only subdue my nervous irritability, I am so much to blame, I should have learned better self control. But the children hurt me so, Loring and Eva by their disregard of my feelings, by their want of love, which they show very often when I correct them ever so mildly, and that irritates me and makes the matter worse instead of mending it. I have resolved and resolved over and over again but it is so hard to see the point of severity to which my duty should make me go, God help me I pray, I am too weak and sinful to aught alone. A Mr. Vandenberg whom I met in Monroe, not long ago, came here Saturday to tune my piano, it is quite improved though it does not sound as sweet as I had hoped it would. I suppose that is the fault of the instrument, not the tuner. Miss Mary and Eva have commenced to practice again. I have been so busy with school and my garden lately that I have had little time to read in my “Girondists,” am very much afraid I shall not be able to finish it this month. We have not yet finished David Copperfield, are in the most exciting part of it now, though to me the book is not exciting, it may be because I have read it before, but I think not, it is too deeply pathetic to be exciting. The weather has for a day or two been very cloudy and as warm as summer but it has cleared off pleasantly cool this evening. Dr. Furness was over Sunday night, says he thinks Mrs. Oliver in a very critical situation, I do indeed hope she will recover. I have had the pleasure of seeing Dr. Bluebecker lately, he spent the evening with us about two weeks ago, I like him tolerably I think, would like him better but that he has such a peculiarly weak, thin voice, which strikes one unfavourably. I think a great deal of character is manifested in the tones of voice. Dr. Melton came over about a week ago with Capt. Oliver’s brother. I liked Dr. M. no better than at first, though his conversation was more pleasing, not being on political matters. 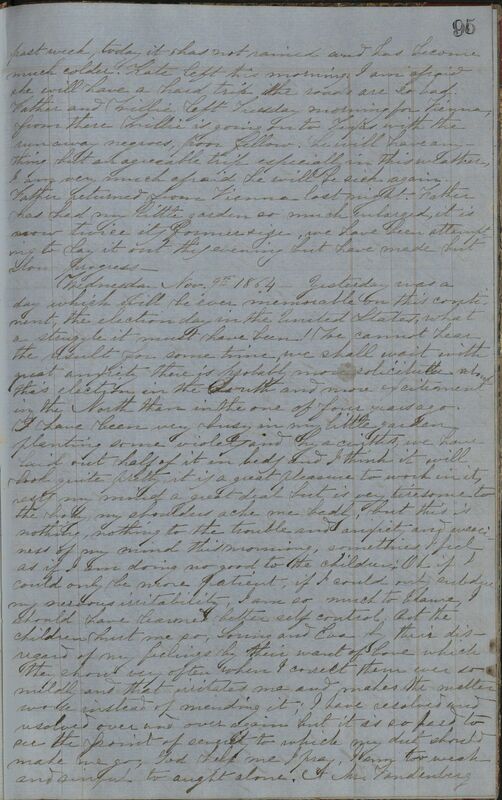 This entry was posted in Southern Historical Collection and tagged children, diaries, diary, election, elections, gardening, Sarah Lois Wadley, social conditions, social life. Bookmark the permalink.